Cozy up to the fire on a cool evening with the Sunjoy Ceylon 7 Piece Dining Set with LP Fire Pit. The modern dining set will set off sparks when guests see the gas powered flame in the center of the round table. The set includes the dining table with enclosed fire pit and six arm chairs. The chairs have raised lattice seat backs and curved arm rests. The seats have light brown cushions for extra comfort. The cushions are durable and have straps to hold them to the chairs. The table with fire pit is round with an enclosed stand base. In the center of the table is a raised circular area for the natural gas-fuel fire pit. The table and chairs are made of durable and heat resistant aluminum and steel. The table has a cast circular design for a sophisticated touch. The table measures 60 inches in diameter and stands 28 inches high. Gas not included. Cozy up to the fire on a cool evening with the Sunjoy Ceylon 7 Piece Dining Set with LP Fire Pit. The modern dining set will set off sparks when guests see the gas powered flame in the center of the round table. The set includes the dining table with enclosed fire pit and six arm chairs. The chairs have raised lattice seat backs and curved arm rests. Carencro Propane Fire Pit 7-Piece Chat Set Cozy up to the fire on a cool evening with the Sunjoy Ceylon 7 Piece Dining Set with LP Fire Pit. The modern dining set will set off sparks when guests see the gas powered flame in the center of the round table. The set includes the dining table with enclosed fire pit and six arm chairs. The chairs have raised lattice seat backs and curved arm rests. The seats have light brown cushions for extra comfort. The cushions are durable and have straps to hold them to the chairs. 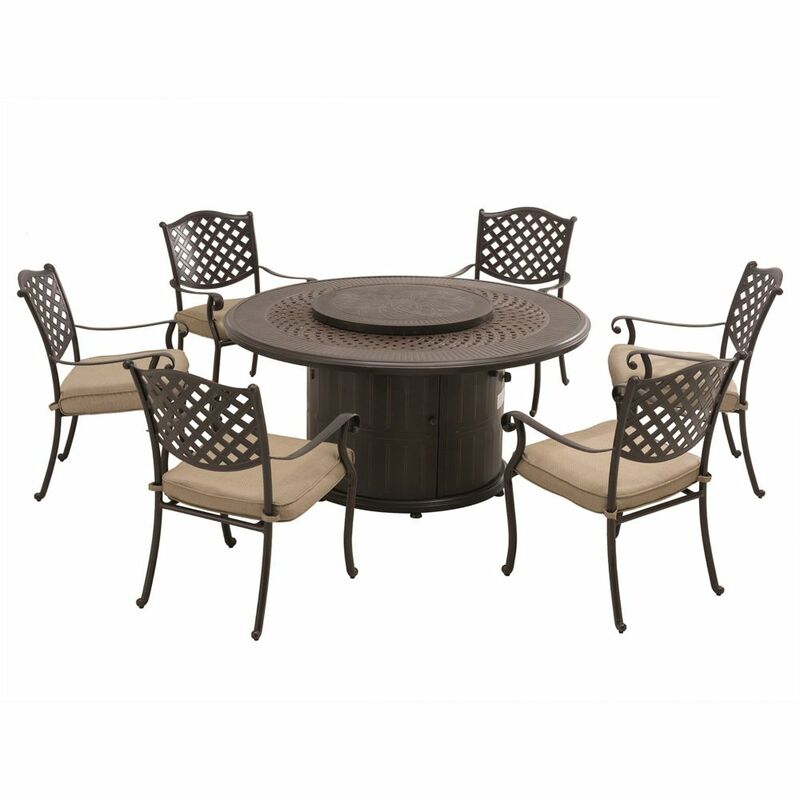 The table with fire pit is round with an enclosed stand base. In the center of the table is a raised circular area for the natural gas-fuel fire pit. The table and chairs are made of durable and heat resistant aluminum and steel. The table has a cast circular design for a sophisticated touch. The table measures 60 inches in diameter and stands 28 inches high. Gas not included.